With their tiny screens, cramped keyboards and relatively limited features, netbooks are sometimes dismissed as low-value devices, good only for reading e-mails and some Web surfing. A new project, however, is establishing a new role for the diminutive computing device. Dubbed Connected Classroom, the project is a partnership between Dell Canada and the Toronto District School Board. Its goal: to engage students using interactive technologies. Both, the Toronto board and Dell are supporting the project, offering discounts on technology purchases. At the Sir Adam Beck Junior School in Toronto last week, more than a dozen Grade 5 students eagerly read stories and typed out school work on Dell Latitude 2100 netbooks. The specially designed netbooks featured colourful rubber cladding in hues such as red, blue, green, yellow and black. In place of the traditional blackboard, teachers used Dell projectors and an eInstruction interactive whiteboard, a much simpler version of CNN’s Smart Board. Using a “clicker” provided by eInstruction Canada children were able to respond to questions with simple “yes” or “no” answers to questions placed on the whiteboard by the teacher. Clickers, which are getting increasingly popular, are handheld devices programmed with a unique student code. They can be used to foster student engagement during classes, conduct in-class polls, and for much more. “I don’t think we’ve seen this many students so interested in taking part in the activities,” said Lee Stem, general manager, information technology services at the Toronto School Board. He cited the example of the touch screen feature added to the Latitude Dell 2100 netbook. It enabled children to apply technology to classroom activity the way they often experience it at home or see it in media. Kids today grow up seeing multi-touch screens in phones, kiosks and ad boards, Stem noted. Devices, such as the clicker, also provide instant feedback to the teachers, he said. The clicker tabulates the kids’ answers and reports back to the teacher’s computer station who has been participating in the discussion. “There’s immediate feedback. The teacher can find out if some children are not listening,” Stem said. Conversely, if many children appear to be entering questions on their netbooks about a certain point of the lesson, the teacher can revisit his or her own teaching methods to determine if they are clear enough. The technology helps the teacher instruct children in a manner that’s most effective, he said. Making technology more accessible to children is a vital in today’s digital era, according to John Kershaw, deputy minister of the New Brunswick Ministry of Education, Anglophone Sector. Many targeted learning outcomes and instructional practices currently being used are “antiquated and ill-suited for this new reality,” Kershaw, also an ITBusiness.ca blogger, said. Kershaw believes a one-laptop-per-student program, is a vital pre-requisite for a 21st century public education. 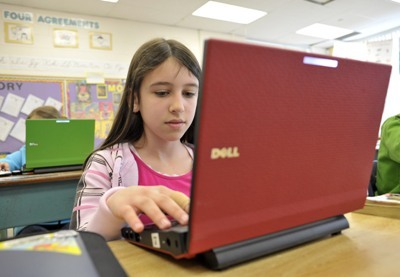 The 24 Dell netbooks deployed for the pilot were specifically designed for school use, according to Paul Cooper, vice-president and general manager for Dell’s Canadian operations. Powered by Intel Atom processors, the Latitude 2100s are basically consumer devices aimed at the sub-$500 netbook market, he said. He said the frame is encased in soft rubberized material to protect the body from bumps and scratches, internal components were re-engineered to improve durability, and anti-microbial keyboards installed with children and playground activities in mind. The machines also have touch screens that can be used to access Web 2.0 tools. Providing laptop access to school children on a much wider scale has been a dream of many school boards. However, the cost of traditional laptops has made this impractical, said Cooper. Netbooks, on the other hand, can be cheaply manufactured and easily configured to serve educational purposes, he said. He said the Dell Connected Classroom program is designed to help schools integrate information and communication technologies (ICT) into every aspect of the learning environment. It combines use of products such as interactive whiteboards, netbooks tablet PCs, digital cameras, and video conferencing tools. The program, which has been used in other countries such as Italy, the U.K., China, Mexico and the U.S., also includes training for educators and school administrators. In Canada, 95 per cent of students have access to school computers but only 60 per cent of them use educational software, he said. For instance, student response systems and software can help teachers determine if their class understands the subject matter. Through a workstation, teachers can view all connected student netbooks simultaneously in thumbnail size images or focus on a single student’s machine.